Usain Bolt, I guess everyone heard his name once in their life. He is a living legend for many people and also known as the fastest man on Earth. It’s his autobiography in which he told how he wins races and smashing records one by one. The untold truth of his life and his journey from teenage sensation to international superstar was very well described in this book. Usain’s home was Coxeath, a small village in Jamaica. He was a mommy’s boy and hates to see her upset. His father was a traditional and very strict man. He believed in manners and respect all the times. Due to all his father teachings, Usain learns how to respect everyone even if they disrespect you. There are so many incidents from his childhood in this book which is well portrayed and his first coach was his family dog, Brownie. Since childhood Usain want to become a cricket player but destiny brought him to track. In school, he never took running seriously until he won few championships and got sports scholarship at William Knibb High School but after that, he started bunk his class and sessions which lead him to low grades and all the teachers and former Olympic sprinter Pablo McNeil tried to explain him the importance of training. Every athlete needs motivation and a good coach in Usain case money becomes his motivation and Coach Mills is the one responsible for making him a legend on the track. The more he wins the more he earns through advertisement. He was only 15 when he won CARIFTA games in Nassau and crowd suddenly started screaming, ‘Lightning Bolt! Lightning Bolt!’ and he got his nickname from there. After winning World Junior Championship he was flashing on everybody’s radar but there were distractions too. Every athlete has up and down in his career and deals with injuries. He also faces this even there was a moment when people started hating him because he loses. But he works hard and with determination or proper guidance of his coach he won a gold medal in 2008 Olympic Games in Beijing. He set a new world record with a time of 9.69 seconds in 100 meters and show his signature pose. 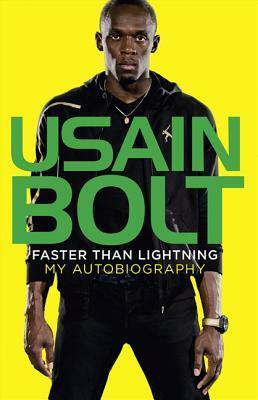 To know one's real aim is very important Usain learn this after his accident in 2009. But life is tricky and records are meant to be broken. There were other sprinters too who give tough competition to him like Tyson, Asafa, and Blake but Usain beat each one of them and make himself clear to the world that no one can beat him. He also won a gold medal in 100 meters race at 2012 London Olympics game. At some point, he sounds arrogant or self-centered but I guess it's not completely true because he is a global phenomenon and undisputed superstar athlete. But media and other athletes time to time question his ability to win. Usain proved them wrong by winning so many titles. There were so many people behind his success. There was some insight information on a player's life and how they overcome fear and prove themselves to the world. This is one of my favorite autobiographies till date. I know his fans will definitely read this because it's really good to know the life story of a living legend and I would recommend this to everyone.